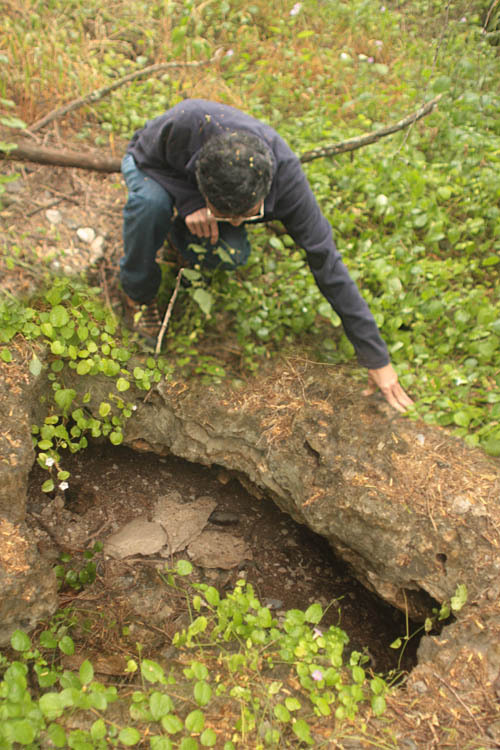 I explored the kiawe forests of Kalaeloa — the former Barber’s Point Naval Air Station — to investigate the innumerable sinkholes in the limestone that were once home to rare native land snails. Limestone, the remnants of coral reefs when the sea level was higher, underlies the greater part of Kalaeloa and the Ewa Plain. Located in the rain shadow of the Koolau and Waianae Mountains, Kalaeloa is located in the driest corner of Oahu, receiving less than 20 inches of rain per year. While the surface of the land is dry and hot for most of the year, just below the surface lies ground water which seeps from the mountains under the Ewa Plain. The vast majority of the rainfall occurs during the winter months with very little rain during the rest of the year. 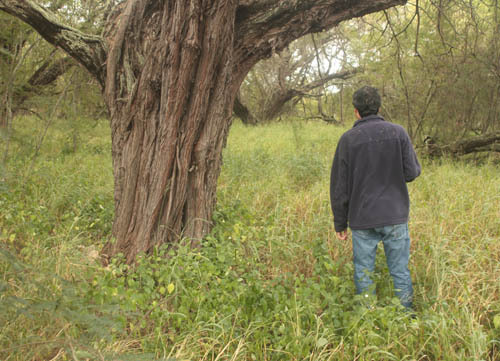 Despite the lack of year-round rain, large kiawe trees thrive at Kalaeloa. 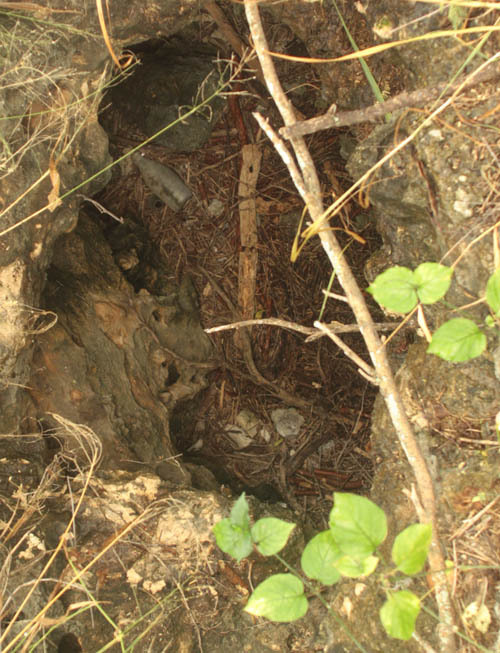 The roots of some trees have been able to grow through the limestone to tap the ground water beneath. 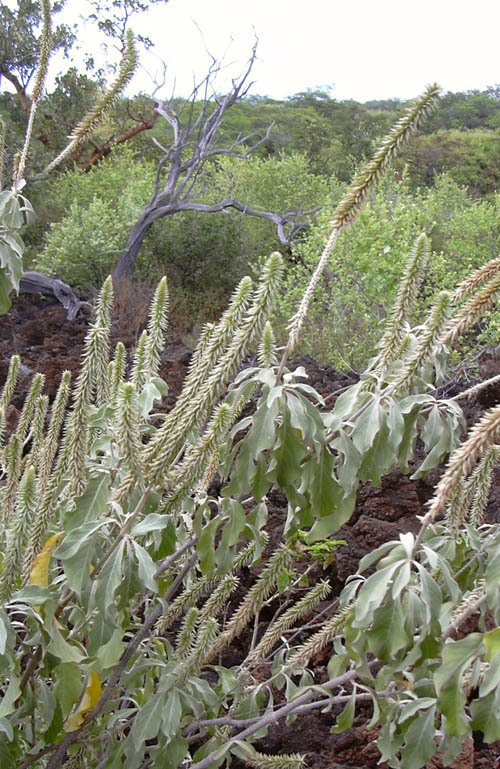 While the vast majority of plants at Kalaeloa are introduced species, a handful of native plants can still be found. 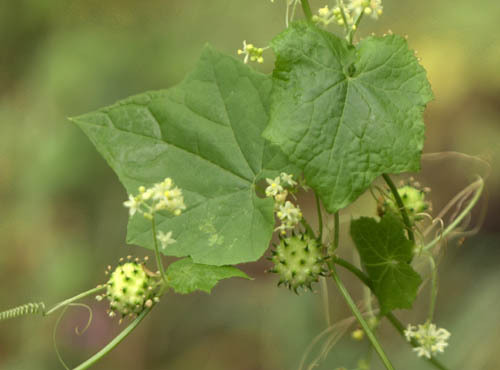 Endemic kapala vines (Sicyos pachycarpus), which produce clusters of little white flowers and round spiky fruits, crawl among the kiawe and haole koa trees at Kalaeloa. The limestone on the Ewa Plain is like swiss cheese with a newtork of holes, fissures and passages carved by the ground water. Sinkholes appear when the surface caves in, exposing the cavities beneath. The deepest holes can be about 10 feet deep and reach the water table. Since the ocean is nearby, the water is often brackish and rises and falls with the tides. Opae’ula shrimps sometimes make their home in these sinkhole ponds. Thousands of sinkholes dot the Ewa Plain, many of which are no more than 4-5 deep and do not extend to the water table. Sediment and other material falls into them and provide a fertile substrate for vegetation. They are also often damp — being protected from evaporation by the wind — an environment favorable to land snails. 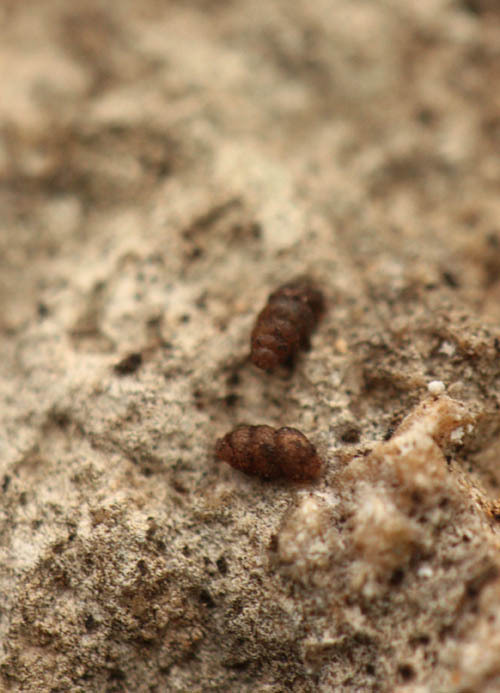 Gastrocopta snails less than a quarter inch long live on the underside of limestone rocks and in sinkholes. These snails are not native — they are an introduced species — and feed on decaying vegetation. 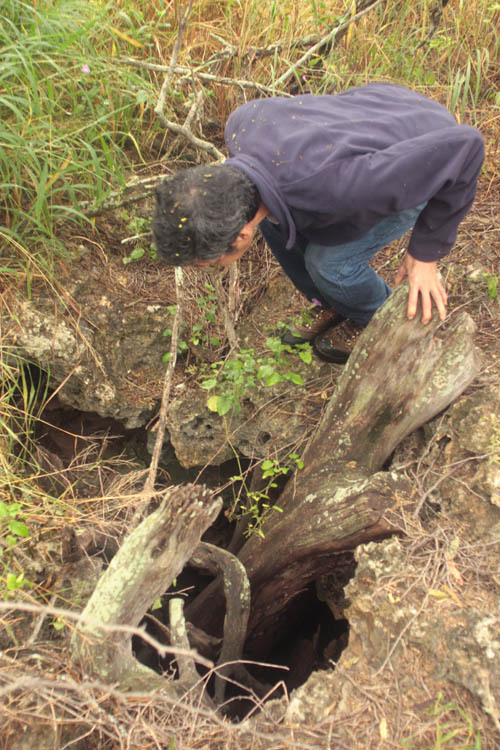 Researchers examine soil layers that collect in sinkholes over the passage of time. Finds of bird fossils, snail shells, rat bones and evidence of human habitation have greatly contributed to our understanding of natural and human history of Oahu. Ewa hinahina (Achyranthes splendens) is one of the endangered species at Kalaeloa. Native to the dry coastal areas of Hawaii, very few speciments of wild ewa hinahina still exist. Time passed quickly as we hiked over the landscape from sinkhole to sinkhole and soon it was time to leave. While I was disappointed that we did not find any live native snails, it was nonetheless fascinating to explore the sinkholes and to see the rare native plants that still can be found in the dry confines of Kalaeloa. Are you aware of any sinkholes in a City & Cty of Honolulu owned parcel of land just west of the Coast Guard Air Station Barbers Point? The C&C EA for acquisition of this land for park use–but now unwanted–had a note that there was a sinkhole there. FYI, when I was with the ACOE, I managed archaaeological & paleontological studies in some sinkholes to be affected by the BP Deepwater Port, esp. w/ my old friend Bert Davis. No… I am not aware of that C&C of Honolulu parcel just west of the CG station. Would you happen to know where the more interesting sinkholes are from an archaeological, paleontologic or biological perspective? I’d like to go back to check them out. The ones we looked at in Kalaeloa were interesting.